In the library at Moy Mell there is a special locked case that contains a worn leather-bound book. 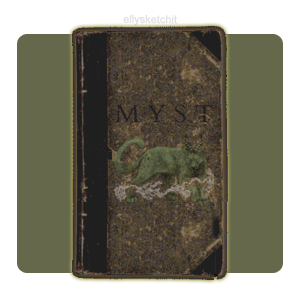 Curious markings are inscribed across the front different from the many magical tomes Elly owns and the two Mysterium stalkers stand guard in front, making certain the book is not touched. If you ask her, the water magi simply says the book will transport the person that touches it to a strange world where one can become trapped in the pages inside the book itself forever. Atrus and Katran were from that world once, and human. But their own sons betrayed them, trapping them both in separate areas apart from each other until the magi came along and helped them escape. Now they make certain that the book will never be used that way again, a stern but necessary duty.